Never mind the length of the ingredient list, this super-tasty fish tagine is relatively quick to make. But if you have the time, make the sauce well in advance. 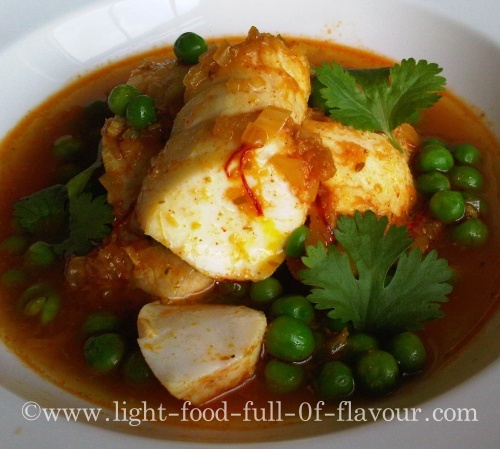 This will intensify the flavours and you can finish off the dish – by adding the fish and peas to the re-heated sauce - really quickly once you are ready to eat. Serve the tagine with couscous or quinoa – and make either of them more interesting by adding finely grated zest of lemon and/or lime, chopped spring onion (scallion) and thinly sliced celery. I only use wholemeal (wholewheat) couscous. This is about taste just as much as health. Wholemeal couscous taste so much more than refined couscous which, let’s face it, has virtually no taste at all. I have bought wholemeal couscous in supermarkets but the tastiest kind by far that I have ever bought is Infinity Foods Organic Wholemeal couscous. I found it in a health food shop. Preserved lemons are sold in well-stocked supermarkets but if you can’t find it there, look for it in shops where they sell Middle Eastern food. 1. Heat the olive oil in a casserole over a low heat. Add the shallots, garlic, ginger and all the spices – including the saffron – to the casserole. Stir and cook for about 7 minutes, until the chopped shallots are soft. 2. Add the tomato puree, fish stock, chopped preserved lemon and season with salt and pepper. Bring the sauce to a simmer. Let it simmer for 10 minutes. Taste and check the seasoning! 3. Add the fish to the sauce. Cover the casserole with a lid and simmer for 5 minutes. Remove the lid, add the peas and let it all come back to simmer for 1 minute. 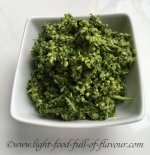 Scatter over the chopped coriander (cilantro) before serving.